In the new War Thunder major update 1.71 you will see updated Battle Tasks. We have increased Warbonds rewards and added new features that will make Battle tasks more interesting whilst the mechanics remain the same. Updated Battle Tasks with an overhaul of the current version of Battle Tasks. We have increased the rewards and added new features that are designed to make Battle Tasks more interesting and attractive to players while preserving the existing mechanics. In the updated version of Battle Tasks, players don’t have to worry about the disappearance of their War Bonds at the end of the month – they no longer have a time limit. Now you can start earning bonds in the current month and spend them during the following month. One of the main changes to the updated Battle Tasks is progress in the personal shop interface. Now, successfully completing Battle Tasks allows the player to not only earn War Bonds, but to also upgrade the shop itself by increasing its level. New goods and a special gift will be unlocked every time the player increases the shop level. Difficult Battle Tasks have been replaced with a new type – Special Tasks. By successfully completing these, the player will earn medals that unlock access to premium goods and a valuable reward. Special Tasks do not have a time limit and more than one can be completed per day. Special Tasks can be found in a separate tab in the Battle Tasks window and you can unlock them by spending a few bonds in the shop. Activist – achieve victory in a mission by earning the required activity percentage (all modes). Grand-Scale Game – destroy bases belonging to the enemy team to win (aviation AB and RB). Bird Hunt – destroy enemy aircraft in tank battles (tank AB and RB). In addition to Special Tasks, another new item will also appear in the shop – the universal backup vehicle. The player can activate this item to backup any one vehicle of their choice. Good news for those who still haven’t earned enough August warbonds. Warbonds duration period will be prolonged for a few days - follow the news! Warbonds duration period will be prolonged for a few days.. Is that means the rank 6 and also updated battle tasks will also come after these 10 days? It was said a couple updates ago there will be no more major updates lol just small updates, has your plans changed from then as there has been and looks like there will be many more major updatesto come! It's good to see how much attention this game gets over a verylong period. Thanks and keep up the work! *cough cough* PSVR!!! Nice work finding this though! Could you implement this system to Simultaor mode too? Or ability to buy Warbonds with golden eagles (or SL, don't care). I don't mind if you offer "regular" premium vehicles with warbonds since I can buy them with real money, but I feel really fustrated when you offer a hidden event plane which cannot be purchased. In SB EC you can't even unlock plane skins. I can understand that some tasks giving faster progress or unique stuff might not be balanced for EC but skins? It won't ruin game even if we get them all in one battle - will it? so if i understand correctly you can now save warbonds for items. is this for just 2 month or for as long as you save? Senio, Let's say i reach 3600 warbonds. Can i have them for a year or more until there is something in the shop i want (a particular plane for example?) Warbonds colors won't make any difference anymore,right? You can save them without time limit. they dont expire and more, its pretty simple. READ. its hard, i know. Well there has to be some breaking point ¯\_(ツ)_/¯ It is still an improvement. Although it does stop you from getting both in a single month, since the warbonds themselves won't expire you can save them up to buy the medals for next month. Lets you take a break once in a while. Personally I find the task for destroying bases hilarious though since they've made it all but impossible due to self-destructing ground units. Expensive? You can get premium vehicle FOR FREE, just by playing the game. And we are the greedy here? Wow. What do you expect? Do you think that you can get a few free vehicles each month for doing nothing? 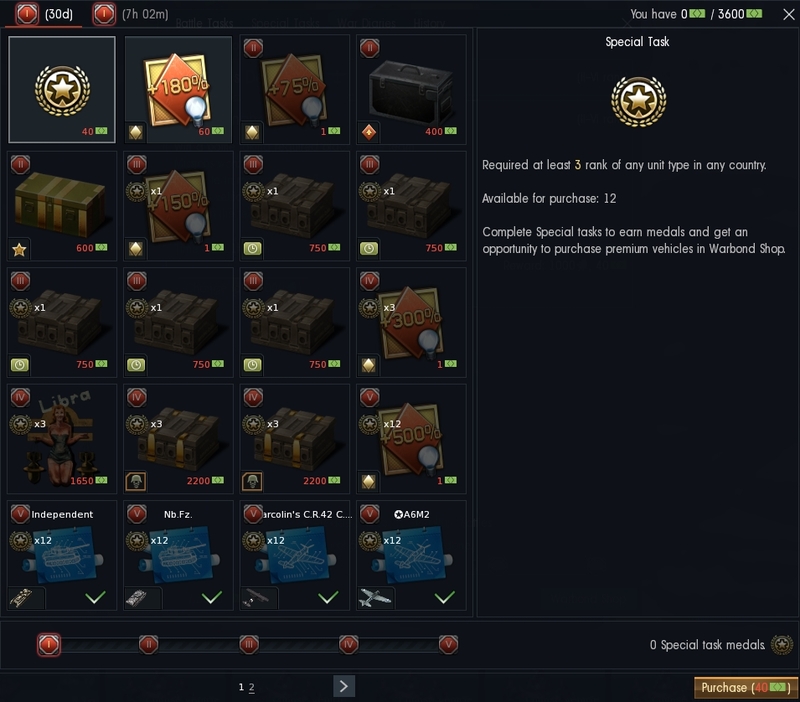 Your reaction is absolutly disrespecting to the Gaijin Team who just give you the oportunity to get premium stuff without paying.